Back along, I made these mini chocolate surprise cakes for a friend’s celebration, along with these dairy and gluten free lemon and almond coconut cakes. 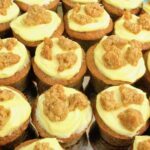 It so happens that I also made some rum and raisin cupcakes and these rather fun apple crumble and custard mini cakes for the same occasion. With ninety four cakes to make in four different flavours, I had a day of logistics to contend with and my mini muffin moulds got used as never before. I adapted a recipe I found in Primrose Bakery Christmas by Martha Swift and used my tried and tested cake mix. I decided having a filling of apple in the actual cake as well as apple in the batter was the way to go. There are a few steps involved in making these cakes, but all of the processes are quite easy. 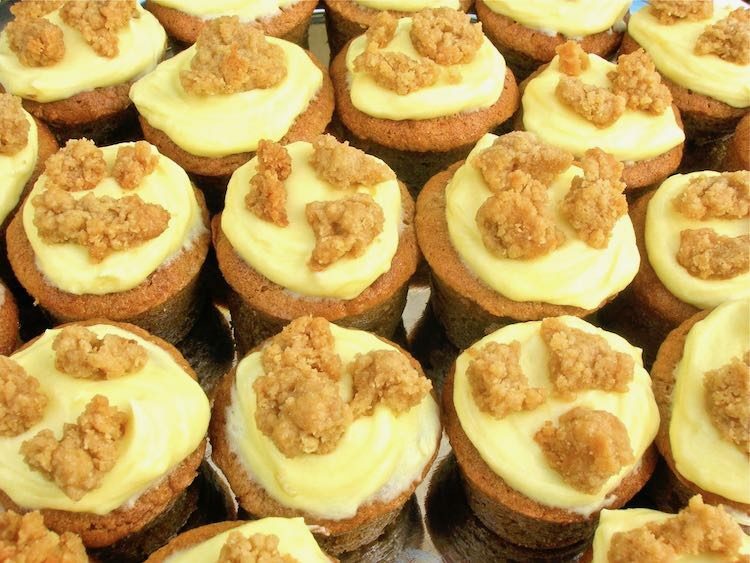 The apple crumble and custard mini cakes are topped with custard buttercream and crumble pieces. They turned out to be very cute and tasty too. Little mini apple cakes flavoured with cinnamon. A surprise middle of apple purée with a topping of custard buttercream and crumble makes them a complete delight. Simmer all the ingredients together in a small pan for about ten minutes or until the apples are soft. Blend into a rough purée with a stick blender. Sift in the dry ingredients and stir gently in. Fold in 1 heaped tbsp of the apple purée. Place 1 tsp of batter into each muffin case (24 in total), add a scant tsp of apple purée than top up with another tsp of batter so the muffin is slightly over 3/4 full. Bake at 180C for 15-20 minutes when the cakes should be well risen and firm to the touch but not too brown. Rub the butter and sugar into the flower with fingertips until the mixture resembles breadcrumbs. Add the water and stir with a knife until the mixture clumps together. Spread out onto a baking tray and bake at 180C for 15 minutes or so until golden. Beat the ingredients together in a bowl until well combined and light in texture. Add a drop of milk if the mixture is too stiff. Spread onto the cooled cakes and top with a little crumble. I am sending these apple crumble and custard mini cakes off to Lisa’s Apple Season link-up over at United Cakedom. If you make these apple crumble and custard mini cakes, I’d love to hear about it in the comments below or via social media. A photo is always good too. For more delicious and nutritious recipes, follow me on Twitter, Facebook, Instagram or Pinterest. You are too productive Choclette ;)) I can’t keep up anymore. 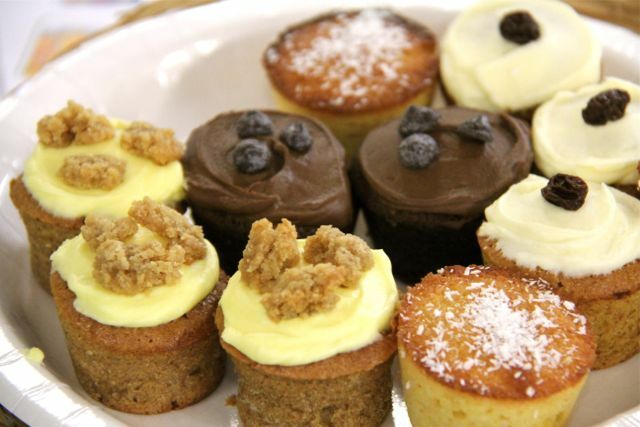 These mini cakes look great and I’m sure they taste great too. Definitely to be tried in some future ! 94 cakes!! wow…surely you had some fun with it. These muffin form cakes look fantastic! Thank you Angie, I really did have fun. It was great trying to think up four complimentary flavours as well as something that pretty much anyone could eat, whatever intolerances they had. Thank you Emily. Really loved the concept of these and they were really cute too. woooahh!!!! 94 cakes in 4 different flavours? Sounds like a GBBO double take! If they were all as good as this, then I am sure they went down a storm! Apple, crumble and custard all in a cake….delish!! Totally lush cakes for autumn – can you post? I can virtually post Camilla, will that do? Yes Ceri, I love the autumn with so many apples and other bounty available. It may be apples now for some time to come. 94 cakes… where’s this party? It should be yours and the Vikings TODAY Dom. Happy Birthday. Sounds delicious. Love the custard and crumble topping idea..
Agree, it’s a good one Erica and perfect for this time of year. This is really a nice combination. .. love the recipe. ..can u tell me the substitute of egg for this recipe! Thanks Waagmi. I’ve not tried it with anything other than egg, so I wouldn’t like to say. But I know flaxseed is often used as a vegan egg substitute. These look great! Pinning to my apple dessert recipes board! Thanks Sara. I think I need one of those on Pinterest too! They look so nice and perfect bite size. Love the crumble n custard icing too – Absolutely Yum!!! Love the recipe, mouth water as always from you Choclette! Just curious does using duck eggs instead of regular eggs enhance the taste in any way? What a great idea! I love cupcakes and I love apple crumble so I think I will really love these. Definitely bookmarking! I really do love the sound of these mini cakes, especially with the puree, custard and crumble. I’m pinning this for later! Thanks Amanda. Hope you like them, they are a bit of a crowd pleaser. I have a teenaged son who would adore these. The combination of custard with cake and crumble is just mouthwatering. These look so good! Bet the apples and custard are great together. Thanks Becky. It’s a classic, although the custard isn’t the real deal of course, it’s just a nod to it really. What a great recipe! And with crumble and custard buttercream – sign me up! Thanks for sharing this. Cake, Custard, and most importantly apples. Yum! Yum! These would be great for bonfire night!